Want to add some serious smarts to any or all of your “dumb” devices? Everyone knows smart plugs are the way to go, but not everyone knows that you can get great smart plugs for way less than the $30+ that big brands charge. 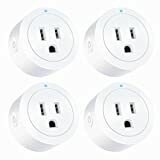 Amazon is running a sale that gets you a 4-pack of Amysen Mini Wi-Fi Smart Plugs for just $39.94. That’s less than $10 a piece, and you’ll get top-rated smart plugs that work with both Amazon Alexa and Google Assistant. These smart plugs have been awarded the coveted “Amazon’s Choice” designation for a very good reason, and it’s high time you found out why.